Since recenty posting our story, Dogs Who Travel, there's been a lot of barking going on around the offices of FarewellTravels. 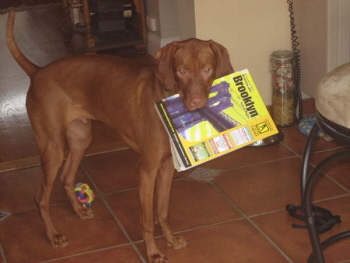 It seems many of our readers have pooches that are seasoned travelers. Firm believers that Every Dog Has Its Day, we've decided to step up to the bowl and give these furry friends the attention they deserve. Each week, we'll be featuring new Dogs Who Travel. You'll meet little dogs, big dogs; pure breds and mixed breeds; puppies and dogs of a certain age; dogs that have passports and some who just travel within their own state. If you have a dog that travels, we'd love to hear from you. You can easily upload a photo and provide details (like those below) here. 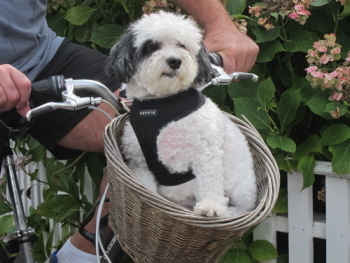 Pictured here basket-riding in Nantucket, MA. Has traveled to: Florida, Maine, Rhode Island, Martha's Vineyard and Nantucket, MA. A Travel "Tail": Jeets has a real nose for dog-friendly hotels and recommends the über dog-friendly Inn By The Sea on Cape Elizabeth in Maine. Has traveled to: California, Washington, Idaho, Montana, Colorado and all over New England. Favorite destination: Craftsbury, Vermont. 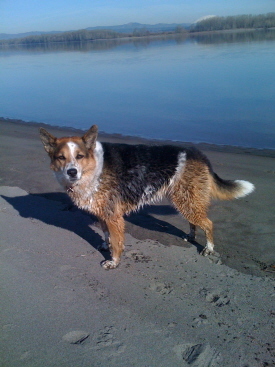 Towhee spends her summers at the Craftsbury Sculling Center with her rowing master and friends (human and canine). A Travel "Tail": 10 years old, Towhee is an avid trail runner, a swimmer, hiker and camper. She loves nothing more than adventures and road trips. The name "Riley" comes from the fact that Sam lives the "Life of Riley." Has traveled to: Martha's Vineyard, MA and Philadelphia, PA. Favorite destination: Martha's Vineyard, MA. Sam learned to swim there when he was 4 months old. A Travel "Tail": Every time Sam sees a suitcase, he panics and goes so far as to block the door or the top of the stairs. Unless of course, he decides he's going on the trip. The last time Sam watched his owners pack up the car for Martha's Vineyard, he bolted out the door, flew out the gate and jumped in the back seat of the car. Sam made it quite clear that no one was going anywhere without him.